FFS performing in 2015 at the Albert Hall in Manchester. From left to right: McCarthy, Russell Mael, Kapranos, Ron Mael (foreground), Thomson, Hardy (background). FFS (an abbreviation of Franz Ferdinand and Sparks) was a supergroup formed by Scottish indie rock band Franz Ferdinand and American rock-pop band Sparks. Their formation was announced on 9 March 2015, but the two bands had been recording since at least the mid-2000s. The group's eponymous debut studio album was recorded in late 2014 and released through the Domino Recording Company in the UK on 8 June and in the US on 9 June 2015. Franz Ferdinand and Sparks originally began working on music together in 2004, shortly after the release of Franz Ferdinand's eponymous debut studio album, when it was discovered that the two bands were fans of each other. They had sent each other a few demos, one of which was "Piss Off", the twelfth track on FFS, but the two bands were busy with other activities and they were not able to fully record an album together. In 2013, it was announced that the two bands were both performing at the 2013 Coachella Valley Music and Arts Festival. While searching for a dentist in San Francisco, Alex Kapranos, the lead singer of Franz Ferdinand, was found by Ron and Russell Mael of Sparks. The Mael brothers invited the band to watch their set at the festival, and later, the two bands agreed that it was time to record an album together. On 9 March 2015, it was announced that Franz Ferdinand and Sparks had formed a supergroup together by the name of FFS. On 1 April, it was announced that the band would be releasing their eponymous debut studio album on 8 June in the UK and 9 June 2015 in the US FFS was recorded at RAK Studios in London during a 15-day period in late 2014. It was also produced by Grammy Award-winning music producer John Congleton. FFS was released to a positive critical and commercial success. Franz Ferdinand and Sparks returned to working on their separate projects. 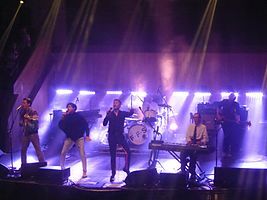 Sparks released album Hippopotamus in September 2017, with Franz Ferdinand's Always Ascending following in February 2018. FFS marked the last participation of Nick McCarthy alongside members of Franz Ferdinand, before he left the band due to family commitments. Alex Kapranos has publicly stated in multiple occasions that Franz Ferdinand has no intention to resume the band's activities. ^ a b c "FFS". Domino Recording Company. Retrieved 4 November 2015. ^ Beauchemin, Molly (1 April 2015). "Franz Ferdinand and Sparks Announce Self-Titled Album as FFS". Pitchfork Media. Retrieved 1 April 2015. ^ "Tweet from Alex Kapranos". 1 May 2018. Retrieved 1 May 2018. ^ "Tweet from Alex Kapranos". 13 July 2018. Retrieved 13 July 2018. ^ "FFS". Official Charts Company. Retrieved 9 November 2015. ^ Ryan, Gavin (13 June 2015). "ARIA Albums: Muse Debuts At No 1". Noise11. Retrieved 13 June 2015. ^ "FFS - FFS" (in German). Austriancharts.at. Hung Medien. Archived from the original on 23 July 2015. Retrieved 9 November 2015. ^ a b "FFS - FFS" (in Dutch). Ultratop. Hung Medien. Retrieved 9 November 2015. ^ "FFS - FFS" (in French). Ultratop. Hung Medien. Retrieved 9 November 2015. ^ "FFS - FFS" (in French). Lescharts.com. Hung Medien. Retrieved 9 November 2015. ^ "FFS - FFS" (in German). Swiss Hitparade. Hung Medien. Archived from the original on 28 August 2015. Retrieved 9 November 2015. This page was last edited on 21 February 2019, at 20:31 (UTC).